Versatile, compact units for molecular biology applications. 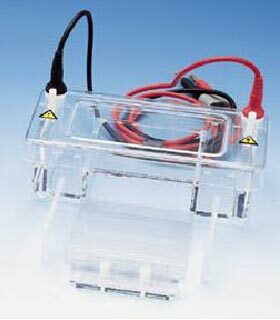 This Power Supply is designed for horizontal and vertical gel electrophoresis applications. Low intensity electro-blotting can also be accomplished. In this power supply model, output is controlled either by time, constant current or constant voltage. Four sets of output terminals allow four apparatus to be connected simultaneously. This power supply's light, compact and stackable design saves valuable bench space as well. Easy to control: Constant V/A with automatic crossover Monitor V/A/T while running, adjust V/A while running, Timer, Safety: no-load and over-load detection, sudden load change, short circuit, etc. PLEASE NOTE: For our International Customers, a 220 Volt version of this item is available as catalog number 16023-220. The 16023-220 comes equipped with a "Continental Europe" plug. Single-sided combs used for well formation in agarose gels. Combs made of polycarbonate material are single-sided and used for well formation in casting of agarose gels for electrophoresis. Combs are available in a 1 mm thickness with 3, 8, 10 or 12 wells. Combs feature adjustable backing for height adjustment. 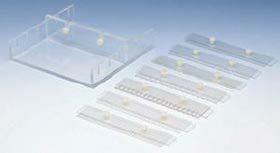 Polycarbonate combs can be used with Gel Casters and Gel Trays to pre-cast agarose gels with ease. Polycarbonate combs are compatible with the Mini Horizontal Gel System. Dual-sided Polycarbonate Combs, Single-sided Teflon Combs and Dual-sided Teflon Combs are also available. Combs made of teflon coated aluminum material are single-sided and used in well formation when casting agarose gels for electrophoresis. Teflon coated aluminum combs dissipate heat faster than plastic polycarbonate combs reducing "lost wells" due to incomplete cooling around tooth. Molten agarose cools more rapidly around teflon coated aluminum combs than plastic so that well and gel formation are complete at the same time. Teflon coated aluminum combs are recommened for use with low percentage agarose gels. Teflon combs can be used with Gel Casters and Gel Trays to pre-cast agarose gels with ease. Teflon combs are compatible with the Mini Horizontal Gel System.Dual-sided Teflon Combs, Single-sided Polycarbonate Combs and Dual-sided Polycarbonate Combs are also available. 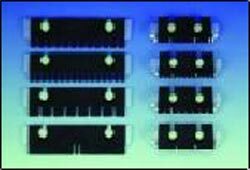 Dual-sided combs used for well formation in agarose gels. Combs made of polycarbonate material are dual-sided and used for well formation in casting of agarose gels for electrophoresis. Combs are available in 1 mm or 2 mm thicknesses with 8 well/16 well and 10 well/14 well formats. Combs feature adjustable backing for height adjustment. Single-sided Polycarbonate Combs, Single-sided Teflon Combs and Dual-sided Teflon Combs are also available. Combs made of teflon coated aluminum material are dual-sided and used for well formation in casting of agarose gels for electrophoresis. Teflon coated aluminum combs dissipate heat faster than plastic polycarbonate combs reducing "lost wells" due to incomplete cooling around tooth. Molten agarose cools more rapidly around teflon coated aluminum combs than plastic so that well and gel formation are complete at the same time. Teflon coated aluminum combs are recommened for use with low percentage agarose gels. Combs are available in 1 mm or 2 mm thicknesses with 8 well/16 well and 10 well/14 well formats. Combs feature adjustable backing for height adjustment. Teflon combs can be used with Gel Casters and Gel Trays to pre-cast agarose gels with ease. Teflon combs are compatible with the Mini Horizontal Gel System. Single-sided Teflon Combs, Single-sided Polycarbonate Combs and Dual-sided Polycarbonate Combs are also available. Accessory for pre-casting agarose gels. The Mini Horizontal Gel Caster is designed to pre-cast your agarose gels for future use in an easy-to-use and easy-to-store fashion and is compatible with the Mini Horizontal Gel System. These support trays have leveling bases and are lined on both sides with soft, coated neoprene to provide firm yet supple support for casting gels without leakage. 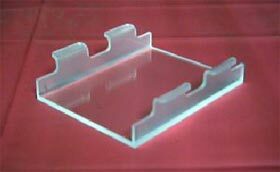 Gel casting support trays are available for casting 1 or 3 mini-horizontal gels at a time. Gel Trays used in Gel Casters are sold separately. Gel Casters are compatible with the Mini Horizontal Gel System.Produced specifically for use in nucleic acid research. Accessory for holding agarose gel during electrophoresis. The Mini Horizontal Gel Tray is designed to hold an agarose gel in place during electrophoresis. The Gel Tray is made from UV transparent acrylic. This allows agarose gels to be scanned at 275nm - 325nm without removing them from the unit. Gel Trays can be used with Gel Casters to pre-cast agarose gels with ease. 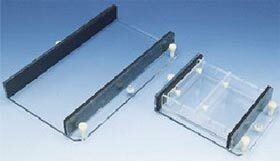 Gel Trays are compatible with the Mini Horizontal Gel System. Compact system for separation and identification of nucleic acids. Machine tapered baffles adjacent to either end of the bed permit quick and easy pouring of an agarose submarine gel. Slide both baffles into grooves next to gel bed and pour gel solution into place. After gel has solidified, simply slide the gates out of the slots and store in spaces conveniently located at either end of the unit for later use. Gels also can be cast in the unit on the accessory UV transparent gel tray. To precast gels in a Gel Tray use Gel Casters or tape ends of tray. Platinum electrode is sealed in side wall, shielding it from the buffer as it descends to bottom of unit, and is only exposed along the base of the reservoir on both sides. This helps to protect the platinum and provides a uniform field across the width of the gel. Precision-machined combs can be adjusted to desired height above the gel bed. Gel beds are made from UV transparent acrylic, allowing gels to be scanned at 275 nm – 325 nm without removing them from units. The Mini Horizontal Unit has gel bed dimensions of 7.5 cm x 10.0 cm. The gel bed is UV transparent. Adjustable height Combs are offered in several thicknesses and formats to accomodate a wide variety of experimental applications. Safety covers come with interlocking power leads and can be easily removed using push-pins. UV transparent Gel Trays are available as an accessory. The tapered baffle system allows gel casting directly into the unit or removable gel trays without having to seal with agarose plugs or tape. Mini Horizontal Gel Casters can cast 1 or 3 gels simultaneously.